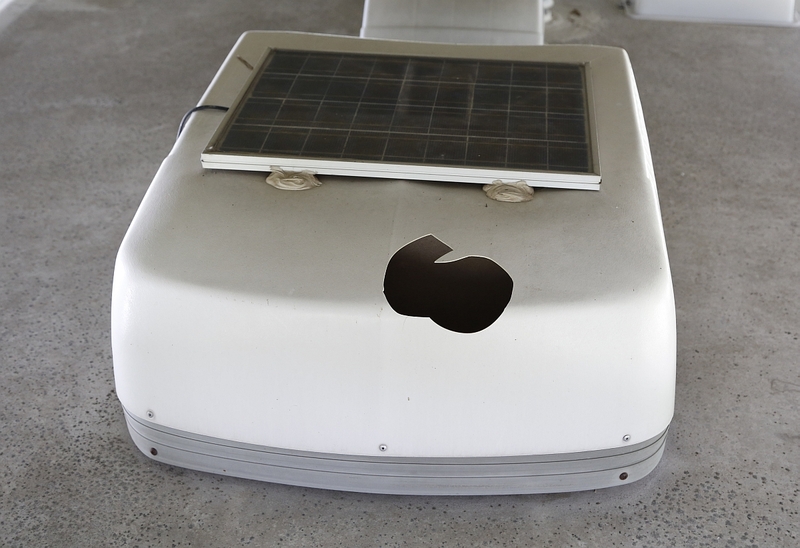 Put a plastic enclosure on top of a motor home and leave it out in the sun for 16 years and it will get brittle. 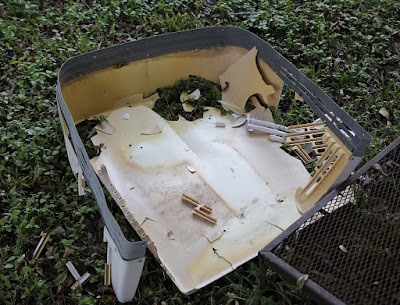 I found that out when I put my palm through this air conditioner shroud while moving around on the roof checking the television antenna. Oops! Well I wasn't too happy with myself, but it probably needed replacing anyway. And, I'll be more careful with the other one. A few minutes later I moved down the roof and guess what? Yep, the other air conditioner shroud was already broken and I didn't do it. So I found myself in the market for two new shrouds. 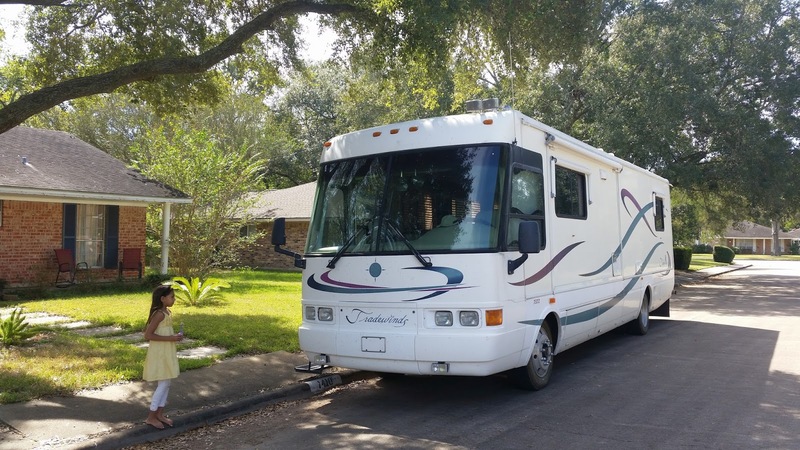 I located a couple sources for new replacement shrouds on the Internet but decided to poll a few other 1999 Tradewinds owners to see if they had any recommendations. They did. 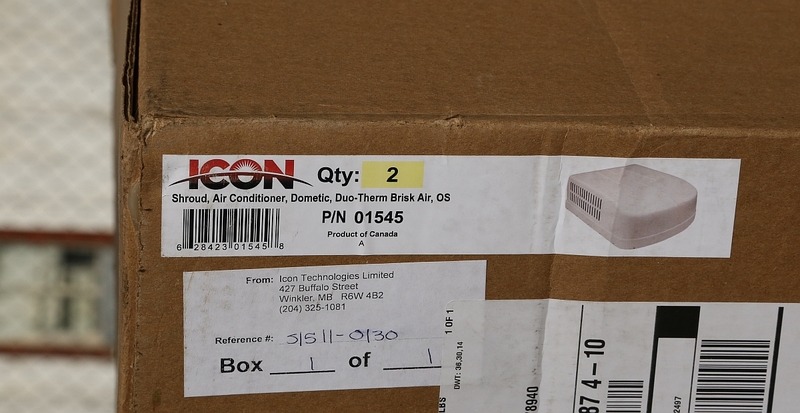 The same vendor too, Icon Direct in Canada. I also found out that I was the only one in our little circle of Tradewinds owners that still had the original A/C shrouds, a distinction I would soon lose. I suspect that a low tree got the second cover. These old shrouds were made in two parts with a gray plastic band riveted around the bottom which itself is screwed to the air conditioner framework. Factory installed solar panels were also mounted atop of each shroud. 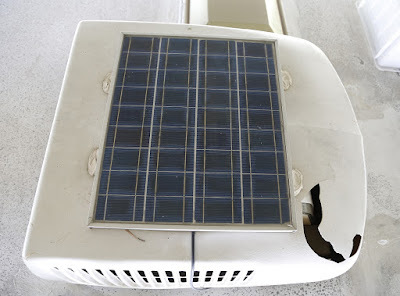 I had thought that these solar panels were glued to the shroud. Wrong! Under the glob of really tough rubber adhesive I found rivets. 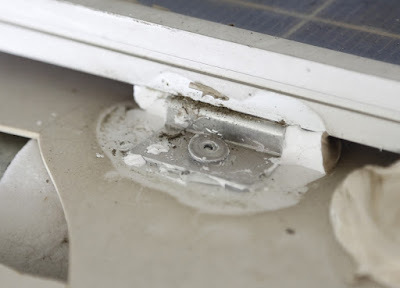 These rivets didn't just attach the panel to the shroud, they went through the shroud into the metal of the air conditioner. Each rivet had to be drilled out before the panel and shroud could be removed. With the covers removed I took the opportunity to clean out small debris and record part numbers and serial numbers. These were indeed the original air conditioners. The new pliable plastic shrouds were quickly and easily maneuvered to line up with the existing screw holes. The original screws were put back into place and I was done. 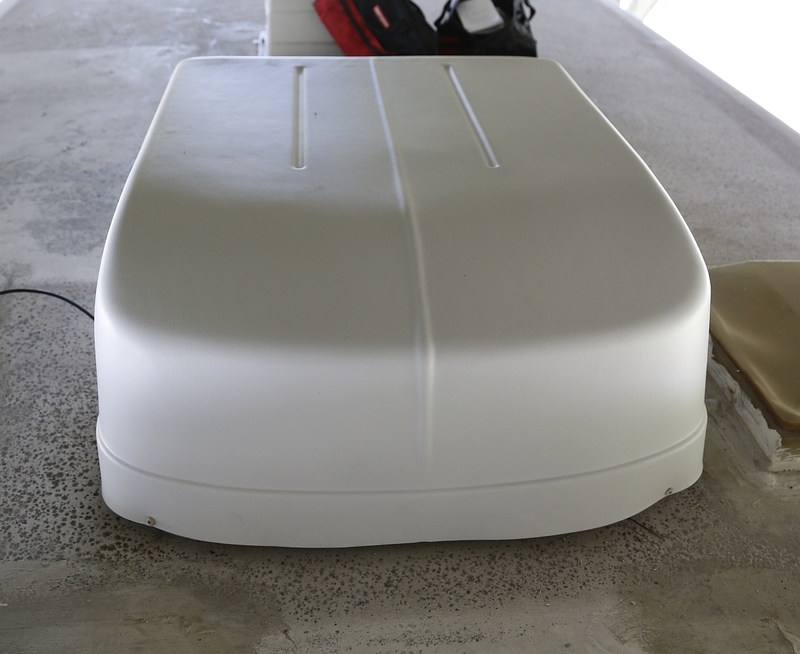 The old covers were vented on the sides and open on the back. 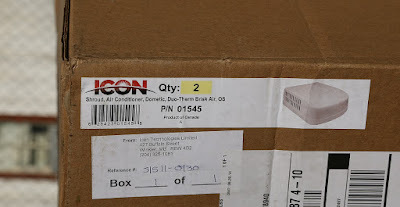 The replacement covers are vented on the sides and the back as well providing better protection for the condenser coil. Re-installation of the solar panels however was deferred. First off I have no expectation that they are functional. If not, why punch holes in brand new shrouds? If we don't boon-dock do I need them at all? If I do, and if I need new panels, it's unlikely the mounting holes will be in the same place. So I'll wait and see. The old shrouds were well past their useful life. 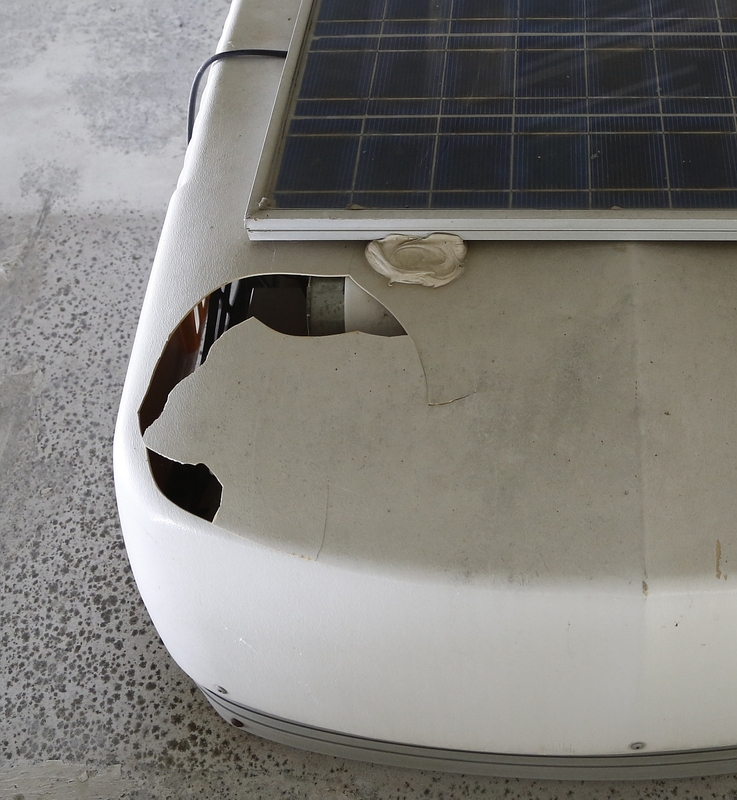 They had become so brittle that when dropped off the roof they shattered. I consider this effort and expense not just a repair, but an upgrade. 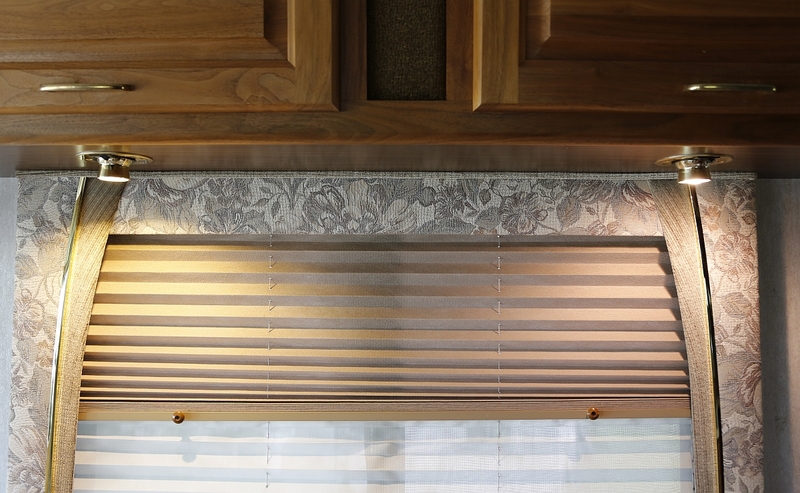 These reading lights are four of the most often used lights in our motor coach. Positioned in pairs over the sofa and love seat, they are not only good reading lights but give the coach a warm home feel when the florescent lights are off. With two, three, or four of these lights on for hours at a time we found them getting very hot. 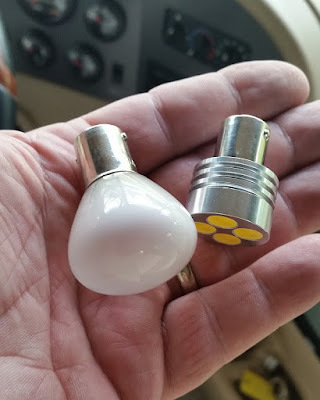 It turned out two of them had the wrong size bulb. 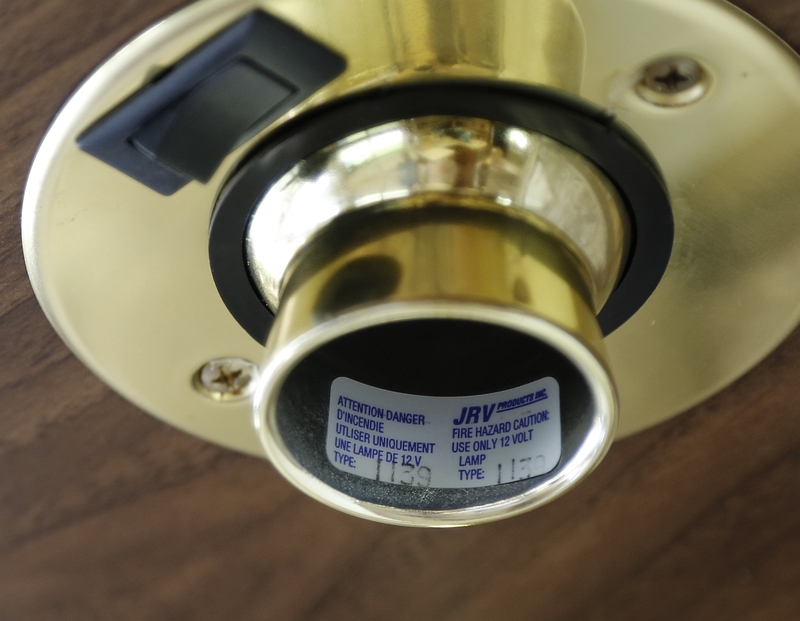 Each fixture is labeled for use with lamp type number 1139. Even with the right bulbs these fixtures get hotter than I would like so I thought this might be a good place to try LED lamps. 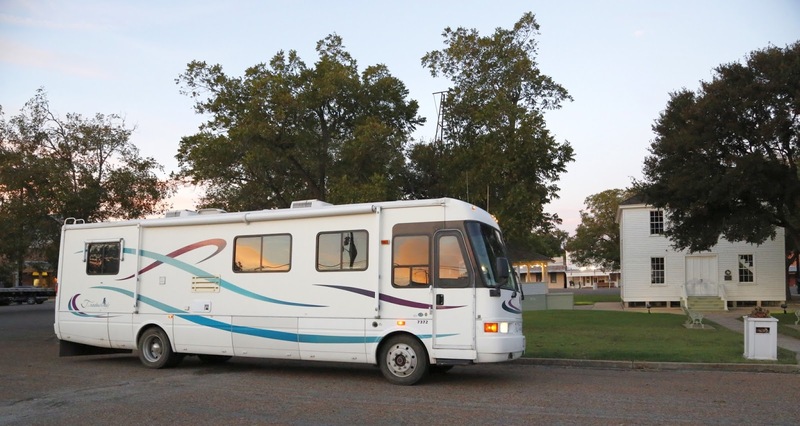 LED lamps are available from numerous sources ranging from local RV stores to the Internet. Color (light temperature) was every bit as important to us as the low heat, energy efficiency, and long life. With so many options we found exactly what we want on the Internet. 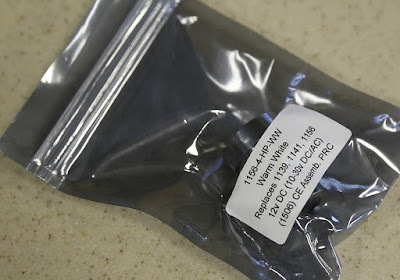 Each of the four LED lamps purchased came individually packaged in anti-static plastic bags. The new LED lamps look every bit as high-tech as they are. The lamps we selected are smaller and shorter. This model has four LEDs on what I'll call the bottom. Other designs have the LEDs on one side, two sides, around the body in all directions, or around the body and on the bottom. This varies by lamp type it replaces and the fixture in which it's used. Some have a translucent cover to resemble a conventional lamp. The new LED lamps sit a little further back in the fixture than the conventional bulb and as a result throw a little narrower light beam. That also means that installing them can be a bit tricky. 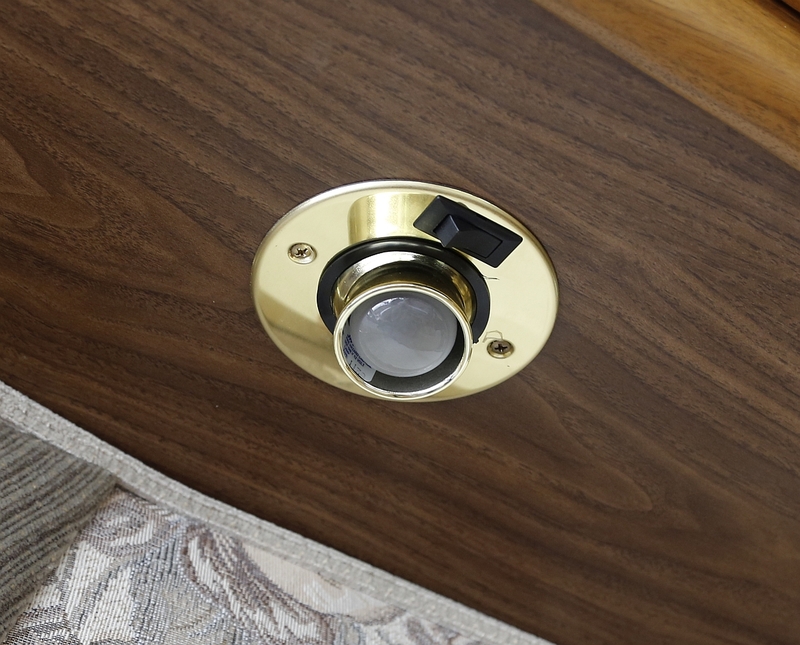 The bayonet base requires the side pins to be in the proper position as you push the lamp into the socket and twist into position. 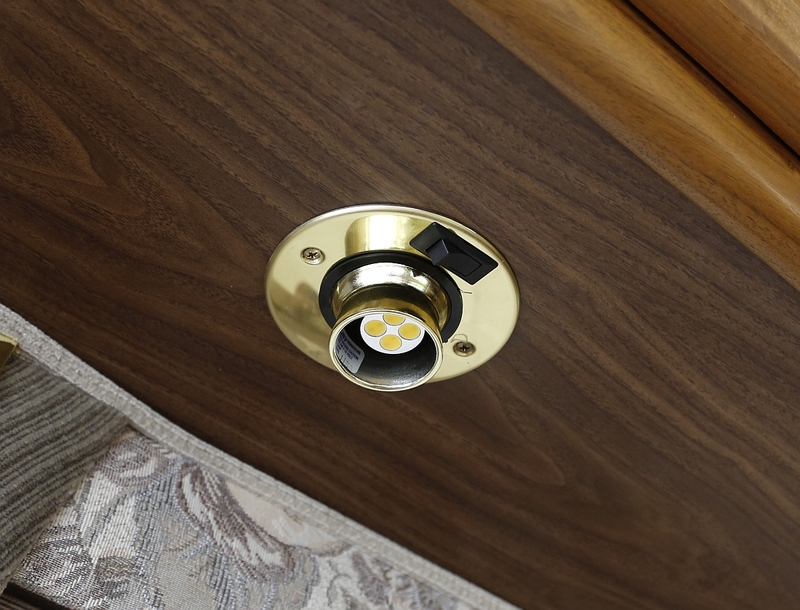 On these adjustable fixtures it's important to hold the movable portion so that the pressure of pushing the lamp into the socket doesn't damage the fixture itself. 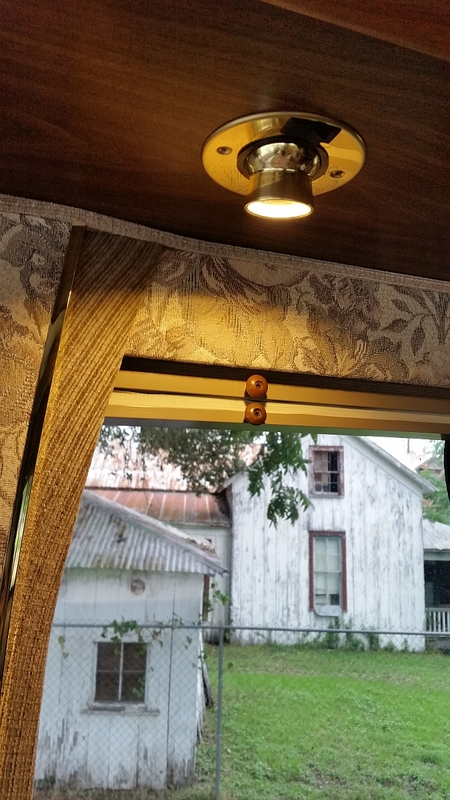 These LEDs mimic the warm glow of a tungsten filament bulb. 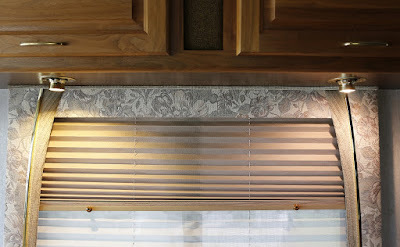 The photograph above contrasts the color temperature of the lamp light inside the coach to the daylight out the window. While not objectionable to us, the LED (left) is a little more yellow than the original incandescent bulb (right). This is, again in our opinion, much better than the blue tint of many LED lamps. This is our first foray into using LED lamps. I think we'll move slowly. Maybe we'll try a LED conversion on the first 12V florescent fixture that stops working. More likely I'll try the brighter LED lamps to replace the backup lights on the rear of the coach. Seems like we arrive at campsites after dark fairly often and a little extra light would be helpful for backing into spaces in the dark. If you were wondering, we purchased the new reading LED lights from M4Products.com and were pleased with the price and very fast shipping. 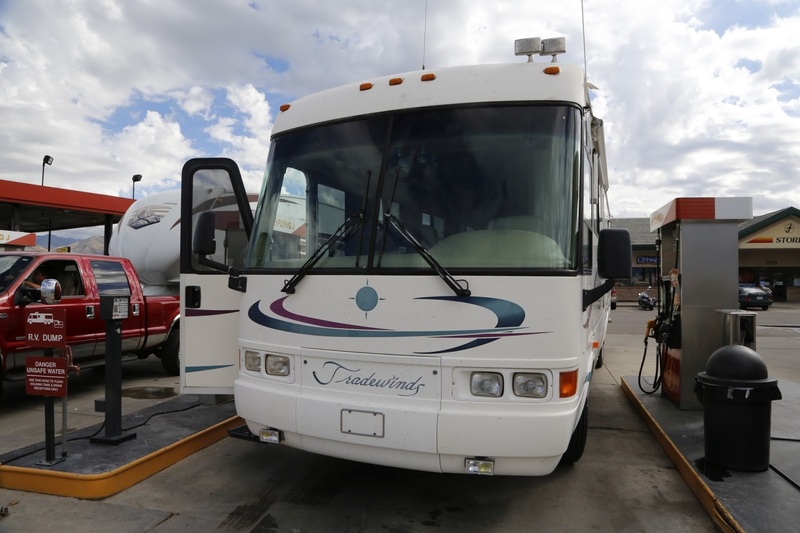 When we bought our motor coach we set a goal of using it every month. Given the constraints on our time (we both work full time) I figured that might mean driving the Kismet to the grocery store or WalMart 20 miles away most months to meet that goal. Fortunately Linda had some better ideas. I have often observed that those who live close to an attraction may go there less than those of us who live further away. Maybe it's a case of not seeing the forest for the trees. Or not appreciating what you have. In any case it might be a big mistake. Taking the travel time out of a short getaway leaves more time for other things. 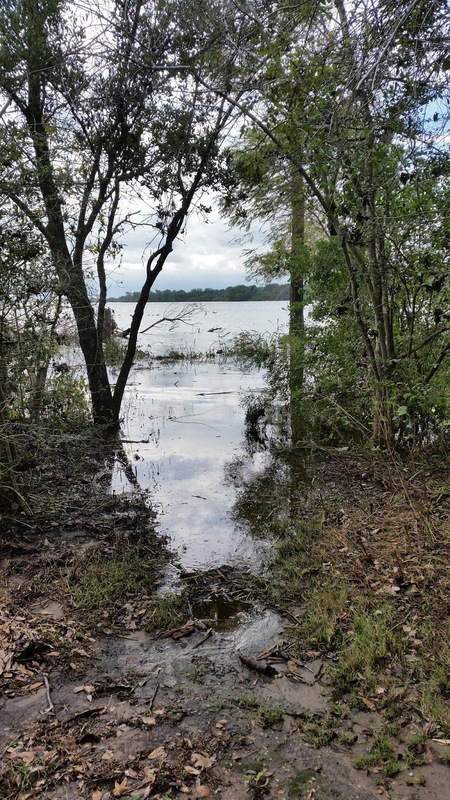 This is Oak Thicket Park on Fayette Lake and it's only five miles away from the MC Kismet's home port. That's right, five miles, or about seven minutes driving. 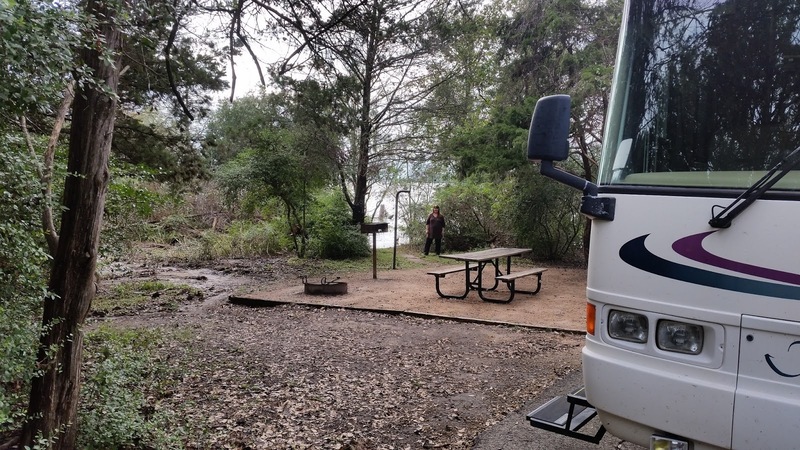 Only recently did we discover that this recreation area operated by the Lower Colorado River Authority (LCRA) included a campground. We had always thought about it as a popular boat launch, but not much more. 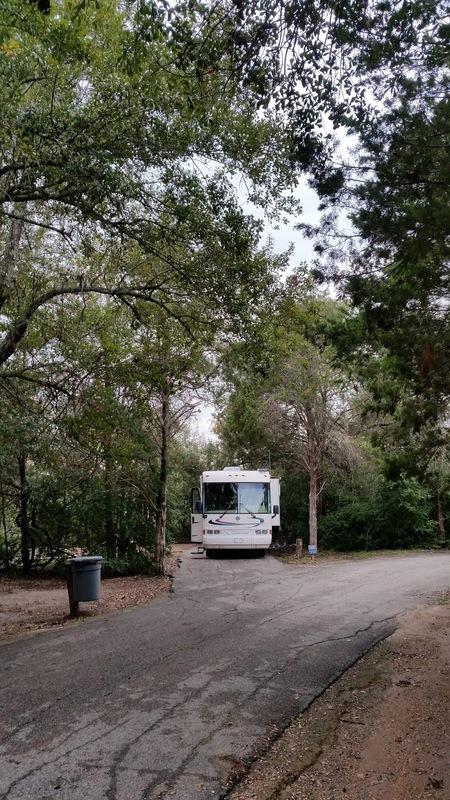 All twenty RV campsites are on a single loop and are back-in spots with electric and water only. Each has a picnic table, grill and fire ring. Most have a nice separation of trees and thicket.The site we selected had 50 amp service and a water view. 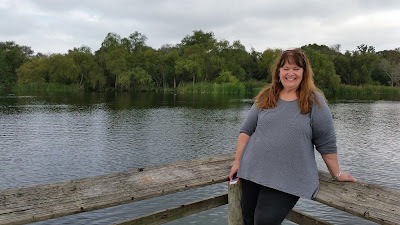 Saturday afternoon we enjoyed the outdoors and fresh air while walking through the park. It would not have made any difference if we were 500 miles from home instead of five. It was someplace new and different. It was in our backyard, yet it was still a world away. Dinner at the Captain's table aboard the Kismet was spectacular. 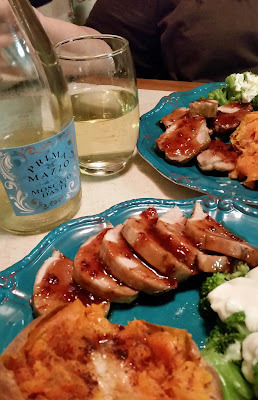 Linda is a wonderful cook and we enjoyed pork tenderloin with raspberry chipotle, baked sweet potato with butter and cinnamon, broccoli, and a glass of moscato d'asti. Our stay was quiet, peaceful and very relaxing. Overnight we had a light rain. 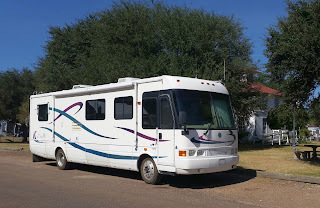 Sunday morning we experienced another Kismet first as we deployed the main awning for our first time. Very nice and much easier to extend than I had thought it would be. Long, deep and high. We'll be seeing more of this awning in the future. As required, we vacated the campsite an hour before noon. However, we just moved the Kismet to the day use parking lot and played with the smaller awnings before taking another walk down to the water. Linda posed on the T-head pier where she was enjoying the sounds and view of the wildlife like ducks and a great blue heron. We had been here a few times many years ago for boating, but had never seen the camping sites. 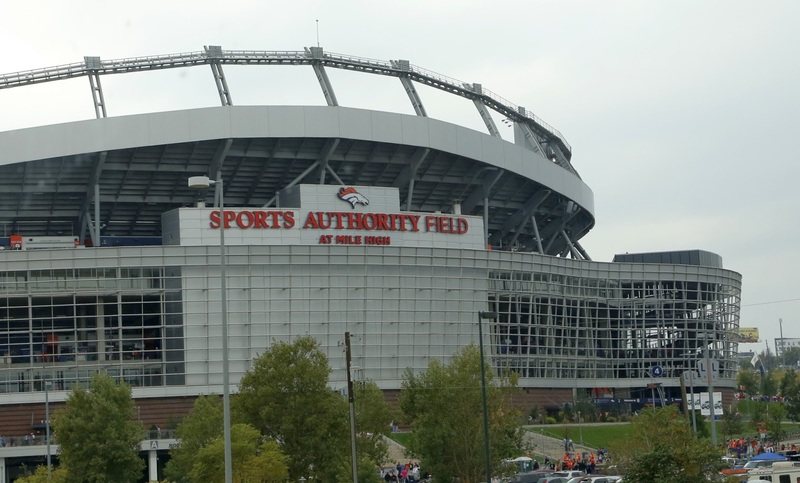 Now that we know what's here, we'll be back. 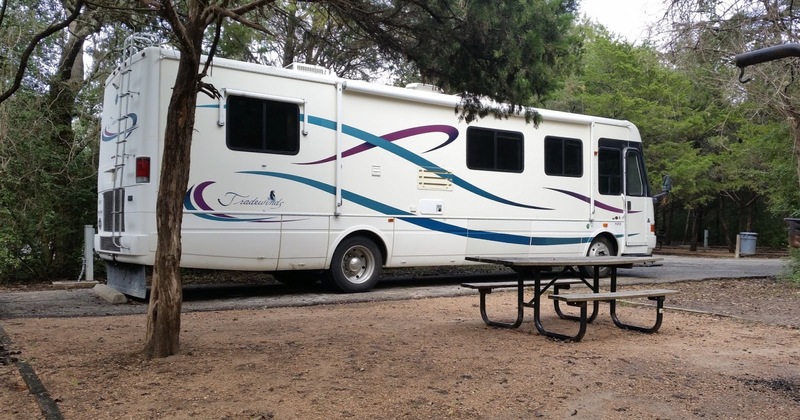 They also have several rental cabins adjacent to the RV camping that we can invite non-RV owners to rent and join us in the future. Cool. What a nice micro escape. 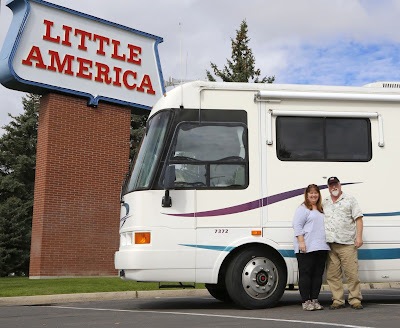 It was only overnight, but with round trip mileage being only 15 miles almost all of that time was at our backyard destination. What's in your neighborhood? If you are just now joining us on our motor coach adventure you can see how this highway life began by clicking on this link: Our Hwy Life At the bottom of each page you can continue by clicking on "Newer Post." With Friday off, Linda and I took the morning to continue the process of outfitting the M.C. Kismet. 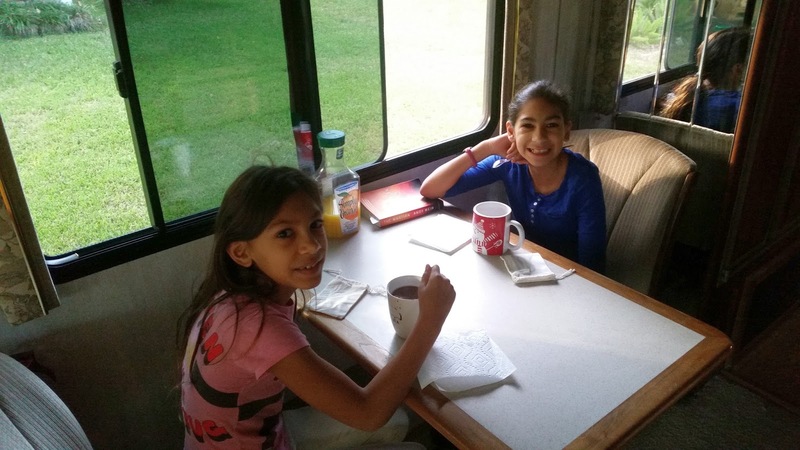 Dishes, pans, a toaster, silverware, tools, and other items were brought to live aboard full-time. We expect that each trip will add a few more items to stay in addition to the groceries that will always be required. 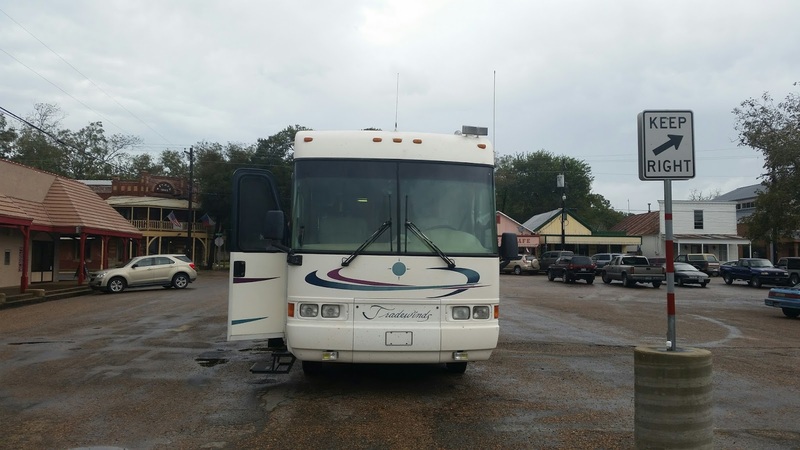 Here we are making a lunch stop on the square in Fayetteville, Texas before hitting the highway. We found ourselves in no hurry. 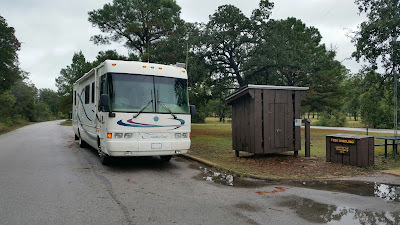 It was raining on and off and we had only a short drive to Bastrop State Park. This was the first trip that our dog Jazz was able to join us. It didn't take her long to feel right at home aboard the MC Kismet. By the end of the second day she was a champ at bounding up and down the five steps of the entrance stairs. Take a Pass and save some cash. This $70 Texas State Parks Pass saved us $32.50 on a two night stay at Bastrop State Park. Three more nights in the next twelve months and we break even. Chances are pretty good that we'll far exceed that number. 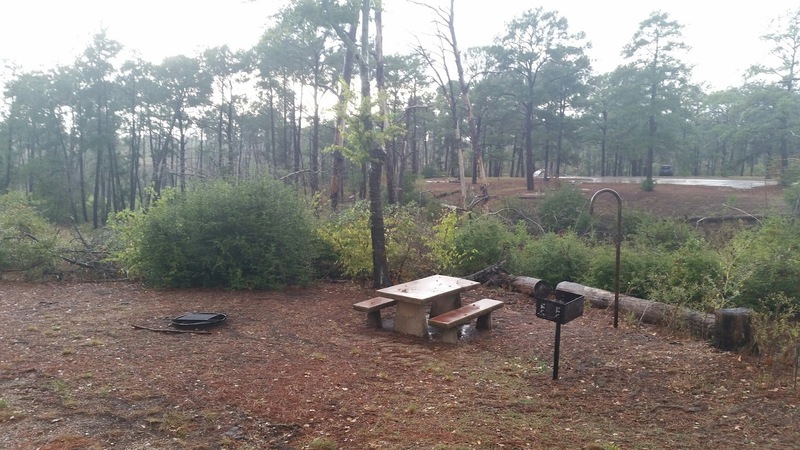 We arrived at Bastrop State Park in the rain and this was the view of our campsite from the Kismet. Friday and Sunday proved to be the only days when the rain gave us any break. By the time we left the two tent campers in the distance gave up and packed up. The heavy and persistent rain wasn't a surprise to anyone as pacific Hurricane Patricia moved across Mexico into Texas. During our entire visit the county was under a flood watch or warning. Friday we had a break in the weather that let us enjoy the fresh air and take a nice walk. The state park was exceptionally clean and well maintained. Being a dog friendly park Jazz enjoyed the walk as much as we did. 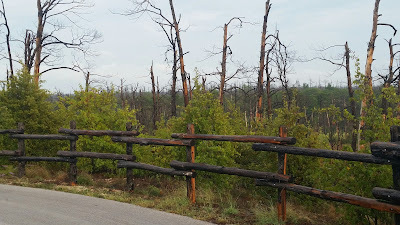 Several years ago this park was damaged by a huge forest fire. Today new growth is coming up amid dead trees and a full recovery is well in swing. 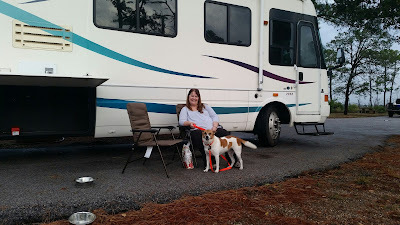 This was the one evening we could sit outside and enjoy the surroundings. So we did. 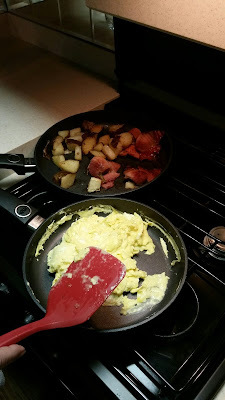 Saturday morning brought our first use of the stove top to prepare a meal. Oh boy, wish you could smell that yummy ham! 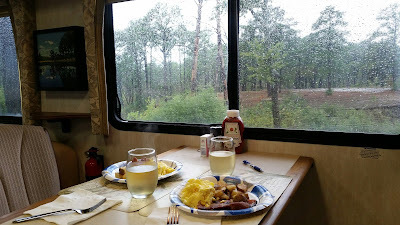 It was wonderful to sit next to our big picture window and watch the rain from the warm, dry comfort of the Kismet dining table. Clearly the Kismet and crew are much more than fair weather sailors. 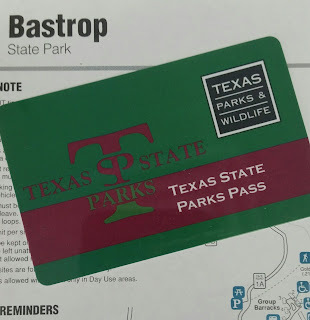 Lots of rain did nothing to dampen our enjoyment of Bastrop State Park. On our way out we stopped at the park office and purchased a sticker, cloth patch, and coffee mug to remember our visit. Not all road trips need to be long in miles or days. Such was the case this weekend. 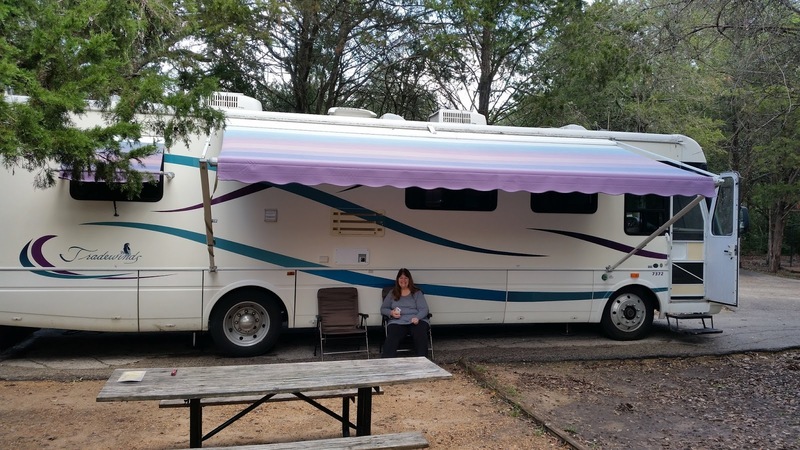 Friday the Kismet traveled only a few miles to join Linda for lunch in Round Top, Texas. Here she is on the square. 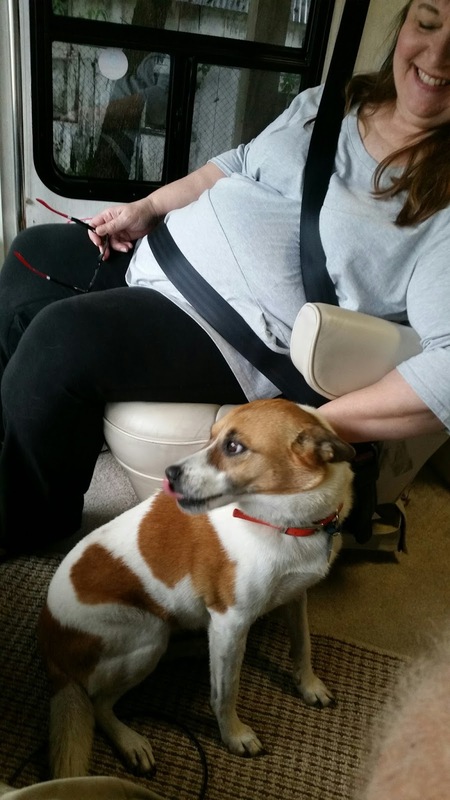 After lunch she got her first Texas motor vehicle inspection. Of course she passed with flying colors. After work Friday we struck off for Houston. About half-way through the short 2.5 hour trip we stopped at Cracker Barrel for dinner where motor coach parking is always convenient. 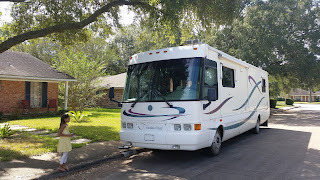 At the end of the day Friday the Kismet was parked in front of our daughter's home. 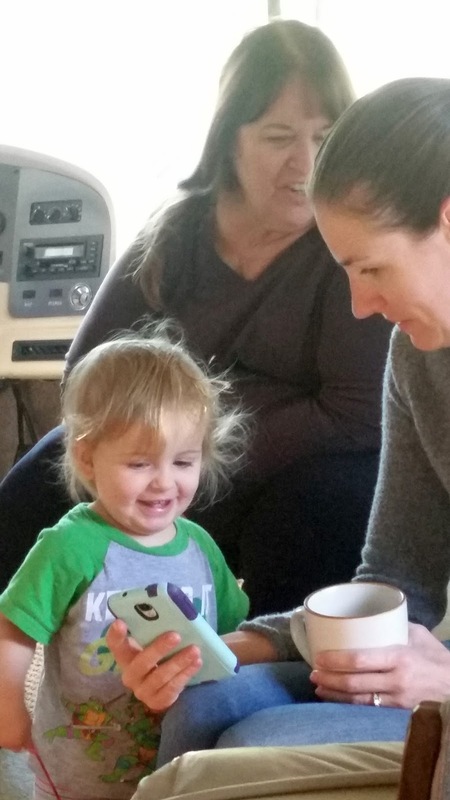 Mimi and Pop-Pop, that's what our granddaughters call us, had arrived. 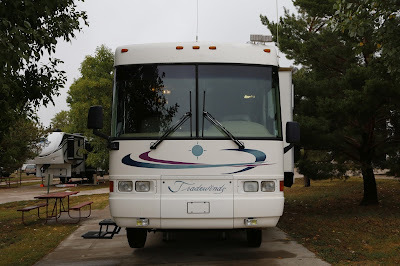 This was the first time our daughter, son-in-law or granddaughters got to see the MC Kismet. 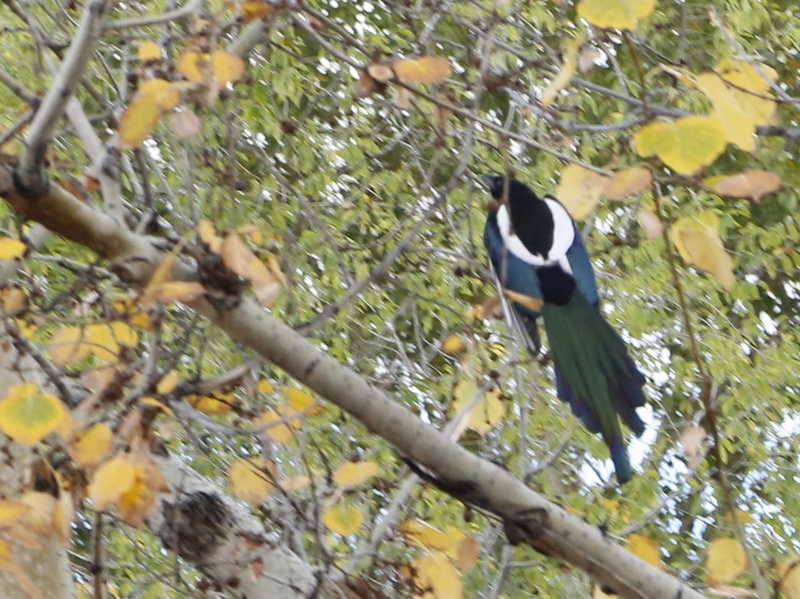 Saturday morning we entertained two special curbside visitors. The older two granddaughters enjoyed cups of hot chocolate at the window side table overlooking their own front yard. What a great way to spend time with grandchildren. Linda brought Willa a new American Girl doll catalog and the two of them discussed all the new outfits and accessories as well as the newest dolls in the collection. 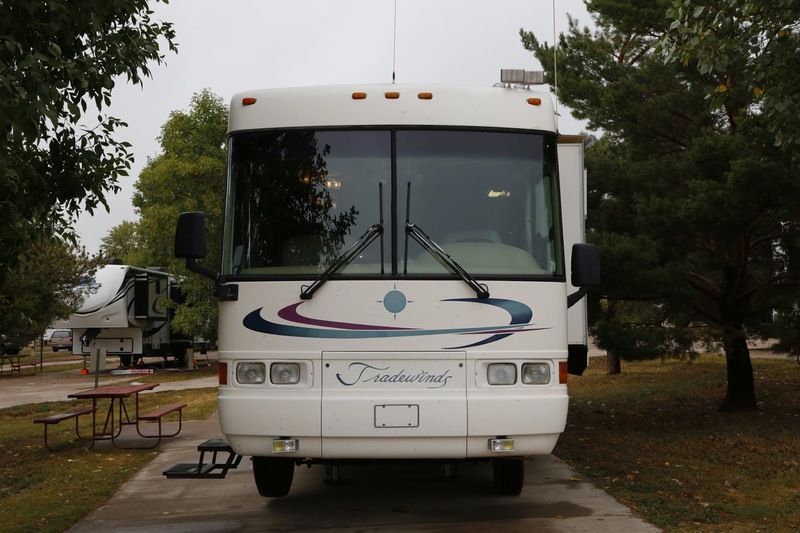 The Kismet's living room on wheels provides lots of comfortable space for everyone to visit. While in Houston we took the opportunity to take out the Sleep Number bed and replace it with another queen size mattress more to our liking. 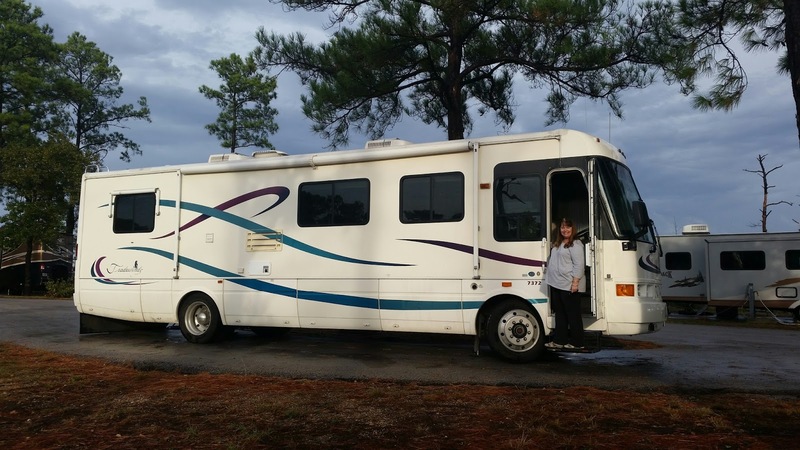 This was one of the important reasons we wanted a motor coach that was designed for a full size mattress, not the shorter RV queen. Since we're not towing a dingy we took the Kismet out for dinner. When we pulled into the parking lot of Miller's Cafe a car came around us and pulled sideways in front of us blocking our turn into a good parking position. The driver was looking directly at me. I was puzzled. When she took her sunglasses off and smiled I did too. I know who that is! It's Sandra, a friend that I haven't seen in about eight years. Turns out she has been following our travels in the Kismet on Facebook and our HwyLife blog. 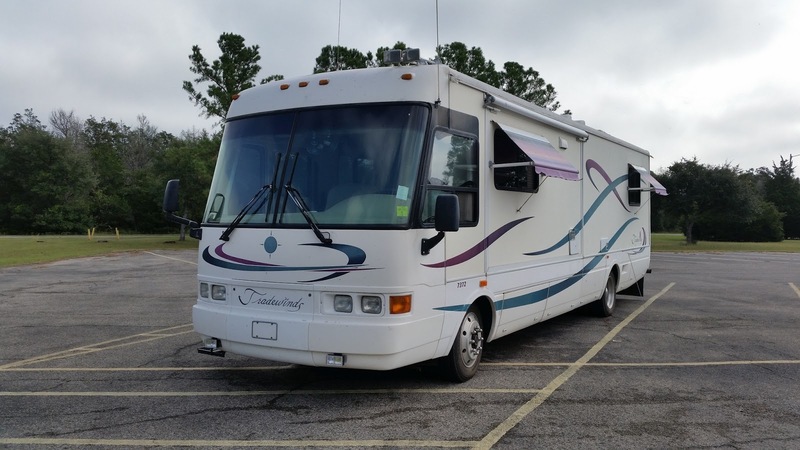 When she saw a giant white motor home with the distinctive markings of the Tradewinds she took chase and caught us! Of course she got piped aboard and given the tour. What a nice surprise. With obligations at home on Sunday it was time to start heading that direction. 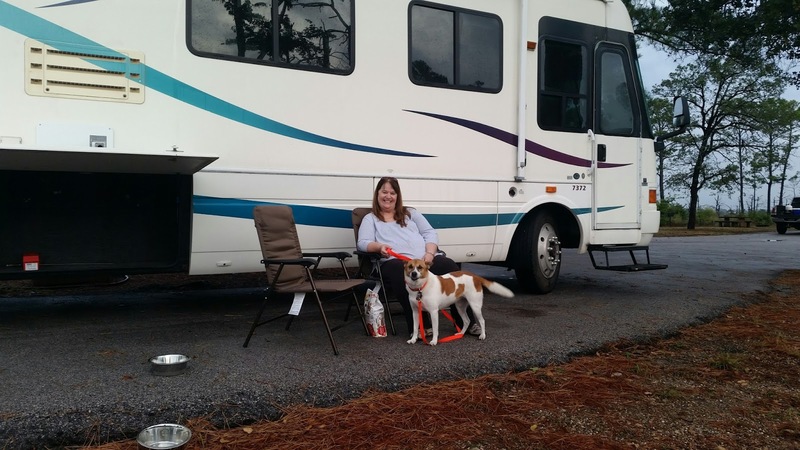 Our only stop on the return trip was to take on diesel in Brookshire, Texas. Even though it was only one night and one full day, it was a very nice visit with our daughter and her family. We really enjoyed bringing our highway home to their front yard. I'm sure this is a trip that will be often repeated. 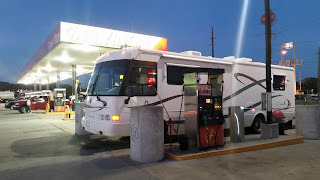 Our first fuel stop. Diesel and propane in the RV lane at Flying J in Salt Lake City, Utah. An interesting bird we saw across Wyoming starting here in Evanston. 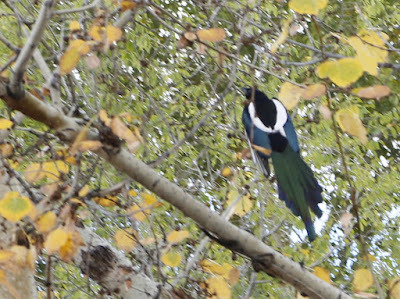 Not a great picture but it shows the black, white, blue and green coloring. Our first "family portrait" with the Kismet at Little America, Wyoming. 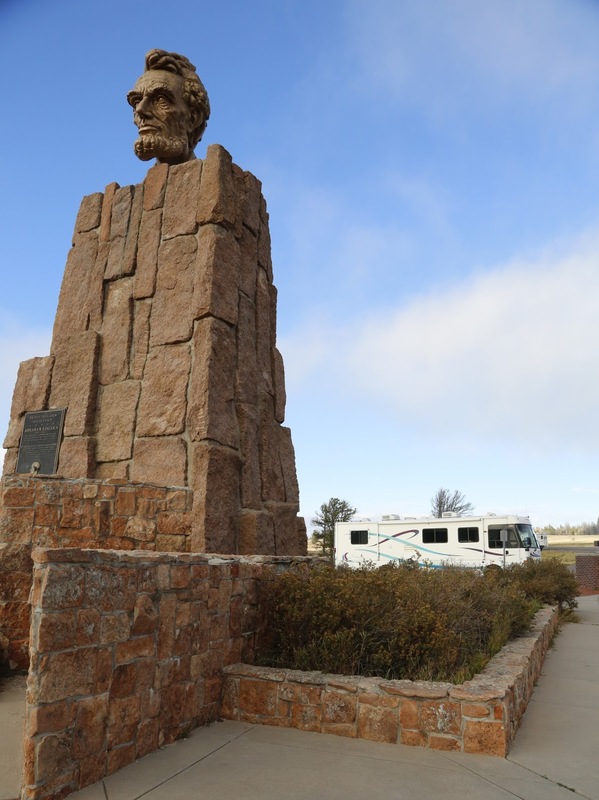 Lincoln Monument at Sherman Summit on I-80 in Wyoming photo bombed by Kismet.. 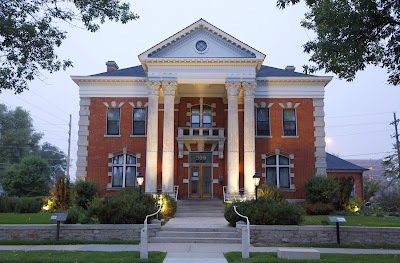 The Old Governor's Manson in Cheyenne, Wyoming. 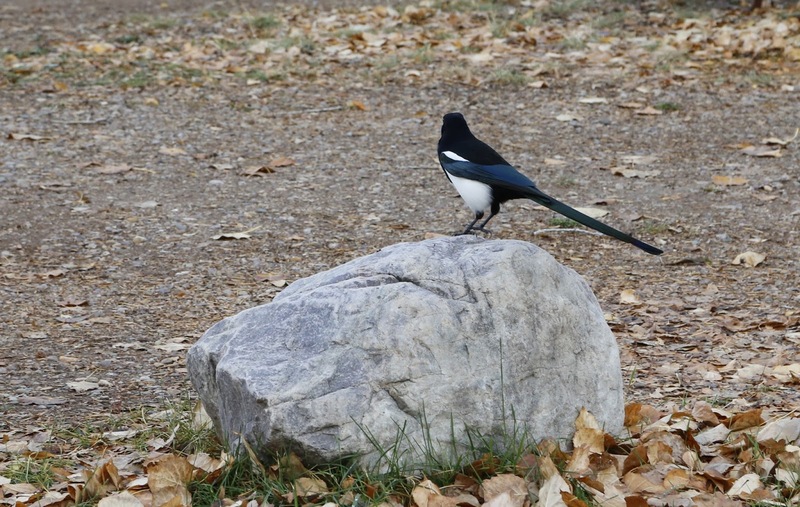 Look'n good in Wellington, Colorado. Mile High Stadium in Denver, Colorado. 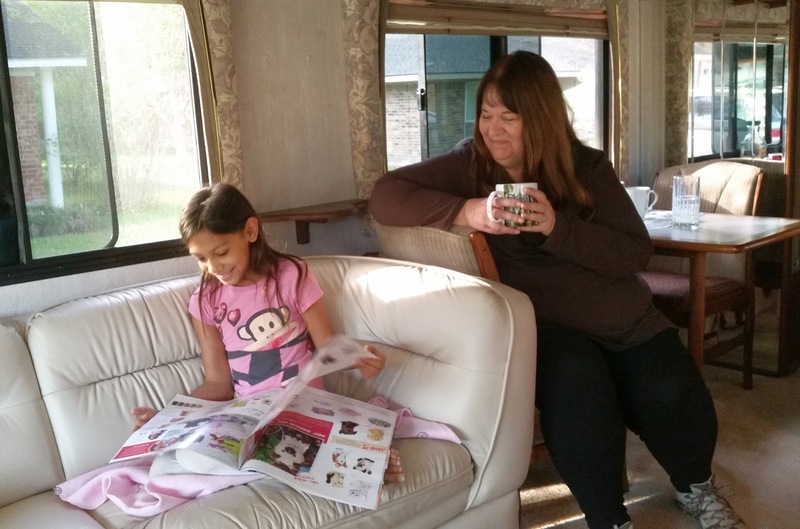 Enjoying the comfortable living area of our motor coach near Bowie, Texas. 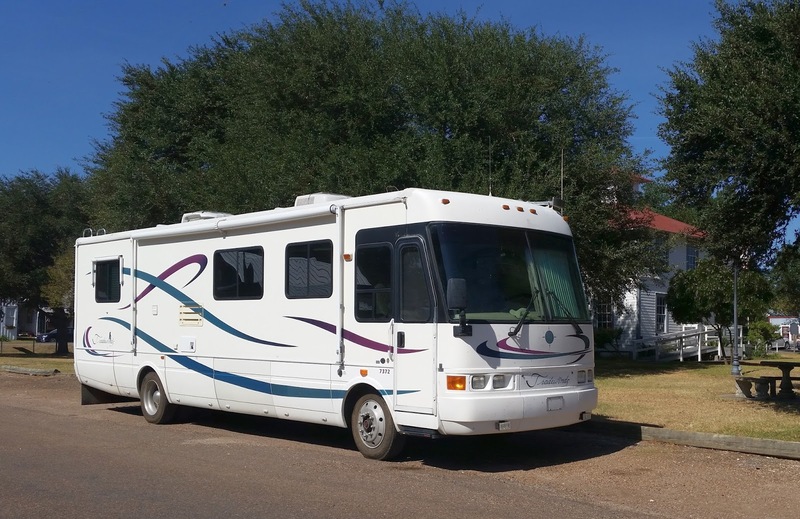 And finally home on the Town Square in Fayetteville, Texas.